Brandon is a graduate of the University of North Texas. 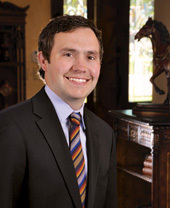 His experience as a landman includes extensive leasing and title research in Texas, in particular West Texas and the north Texas Barnett Shale play. He is also experienced in Arkansas, Colorado, Illinois, Indiana, New Mexico and Kansas. Brandon has experience in both rural and urban areas. Brandon is a strong leader and has managed dozens of landmen and multiple prospects for Eagle. His primary focus is in leasing both commercial and residential tracts for Eagle’s clients. Clients and teammates alike appreciate Brandon’s strong work ethic, commitment to service and integrity. Brandon is a member of the AAPL and FWAPL.